You can now add and remove owners in the Customer Portal. 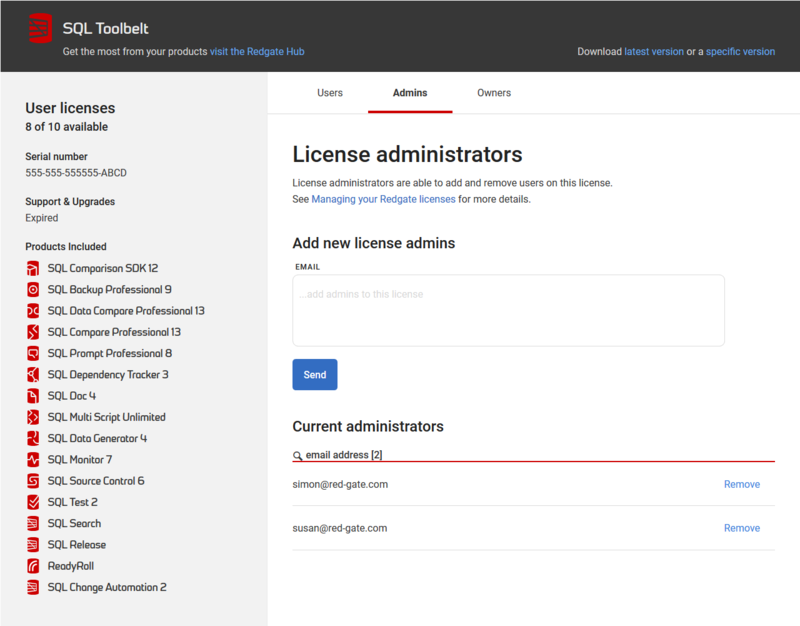 If you are a license owner, click Admins to associate any number of license admins with the license. A license admin can see license information and perform all actions relating to inviting and removing users from the license. Similarly, license owners can be managed using the Owners tab. A license owner can invite and remove admins on a license as well as managing allocated users. License owners can also invite and remove other license owners. License admins and owners do not consume a license activation unless they have also been invited to be a license user. To invite a person to be a license admin, enter their email address in the input field and click Send. That person will need to log on to the Redgate website with their Redgate ID. If they don't already have a Redgate ID, they can create one using the email address that was used to invite them. See more information about creating and using a Redgate ID . You can also enter multiple email addresses to invite more than one license admin at a time. To remove a person's license admin rights, click on the Remove button alongside their details in the list. Then confirm the removal by clicking the subsequently displayed Remove button to remove them. If you would like to request to become a license owner, in the customer portal click on add existing license and enter the serial key. An email will be sent to any existing owners of the license asking them to accept or reject your request. When the existing owner has accepted you will become an owner and will be able to see the license in your account. In some instances the existing owner may have left the company, when this is the case, if there are no other license owners to accept your request, the request will pend for 10 days and then automatically accept. If you are unable to wait 10 days, please let us know.